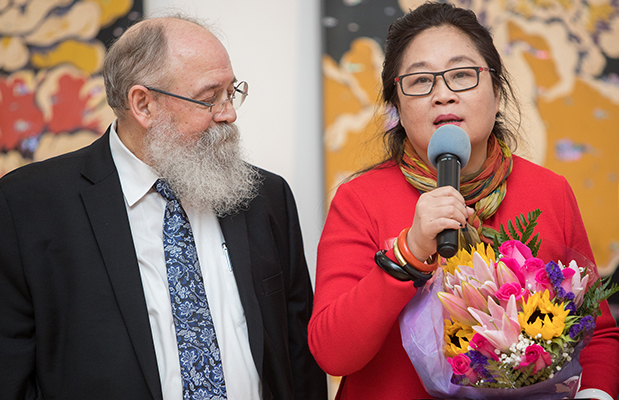 An elaborate closing ceremony was held on January 25 in the QCC Art Gallery to honor the exhibit Daqi as Medium by Wenzhi Zhang, an internationally recognized artist, scholar and author. To mark the closing of the exhibit, the QCC Art Gallery partnered with the New York Han Culture Association to hold a series of performances at the event on the Chu and Han dynasties, the historical origin of Chinese Traditional Daqi Culture. Performance highlights included a Hanfu walk show of exquisite clothing of the Chinese Han ethnic group; a Kunqu Opera, one of the earliest forms of Chinese opera; a Han Dance, a historical Chinese folk dance; a formal tea ceremony; and a traditional instrument musical performance.